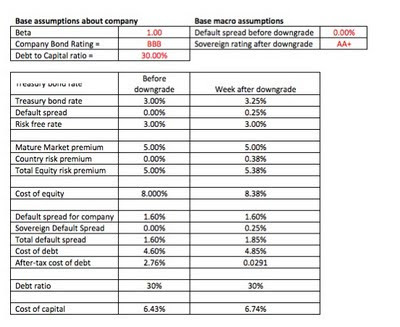 Musings on Markets: A Sovereign Ratings Downgrade for the US? End of the world or bump in the road? How helpful/hurtful do you think ron paul's views would be to the underlying issue. He has been bringing a lot of attention to the Fed. Is this undue? U summed up really well...I totally agree with U...Well written!! The bond markets have already priced in an implicit default; I suppose going forward foreign investors may perhaps have more reason to be concerned on the fact if the US may in fact inflate away its debt, through a gradual decline in the value of the greenback. This will harm countries like China, Japan the most (holders of US Treasuries), however on the contrary help US in reducing its deficit. May sound a bit wicked, however do you think this is what the chaps are up to? 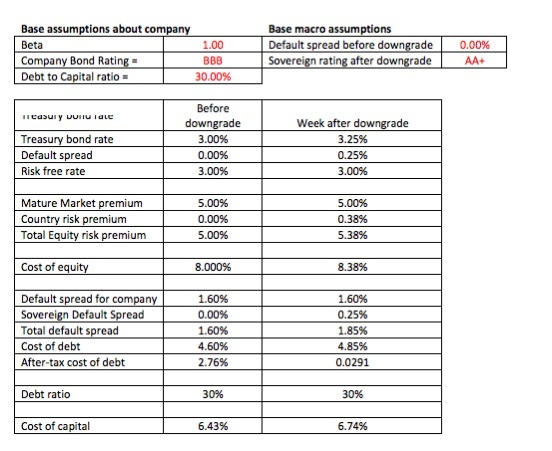 How does the model change to admit the Japanese scenario, where rates continue a long decline even after a downgrade? I am a bit confused. Why is the country risk premium (0.38) different from the default risk premium (0.25)? Thanks. TO DV: The reason why the country risk premium is .38 is because the original .25 premium is computed for the T-bond market. The spreadsheet scales this number up by 1.5 in order to assume an equity market default premium (stocks are more risky, volatile, than T-Bonds). Alas,finally US got senate approval for an extension of its borrowing limit and comments have been spread accross the community that this ( printing/borrwoing of more money ) will lead to furhter inflation in commodity prices. Will it hurt the middle ( working ) class community of developing world in terms of money to be spent on food and other lively hood ? Regarding DV's question, I definitely agree with the answer served by Wonderlight. 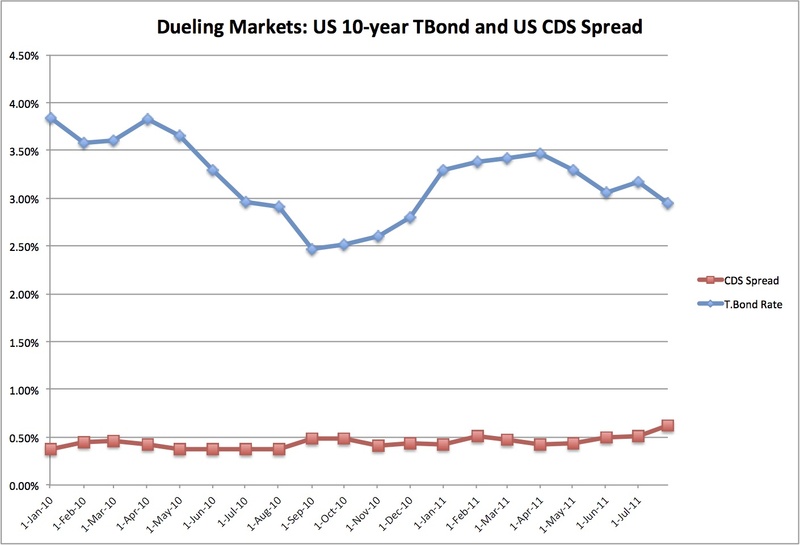 I would just like to add that a way to capture the scaling up factor is to compute the ratio between the average standard deviation of US equity market and the average SD of US bond market. Because the broad equity market in the US don't have the same risk as the us treasuries, but a higher one. The country risk premium applies only for the state's titles themselves, and for the companies to be perceived to have the same risk as the government, or even a lower risk. For the rest of the companies, the risk premium is higher. Very interesting article, thanks Professor. However, I wonder why exactly the US sovereign credit spread impacts the cost of debt for an individual firm. I would assume that the country risk component is already priced into the corporate's credit spread (as expressed by its CDS rate). Likewise, I assume that a corporate's rating as determined by agencies already reflects circumstances such as the firm's geographic location and the corresponding political, financial, monetary and further environmental risks. 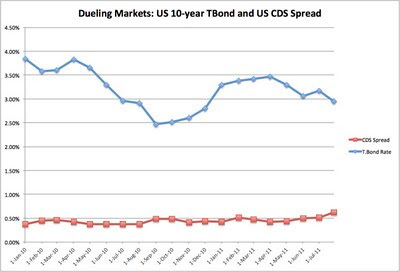 In this context, can anyone please explain why a firm's cost of debt is not merely comprised of the (US CDS adjusted) riskfree rate and its corporate credit spread? Great post professor! However, don't you think the default-spread of 25-bp would already be modeled in an implied ERP model (we subtract the market premium from risk-free rate)? And it's just the excess 13-bp that needs to go into the ERP as a country risk premium and not the entire 38-bp? and, say, riskfree rate is 3%. But how we can get this earning rate, assumed US govt. will be default then actual return we'll receive is zero? and if we can't get this rate in real world, does it make sense to view it riskfree rate?